Placebos can trigger biological changes similar to those caused by drugs – even when you know you’re taking them. In April, Ted Kaptchuk addressed hundreds of physicians and scientists at the Behind and Beyond the Brain symposium in Porto, Portugal. Within minutes, ripples of laughter were spreading around the conference hall. Kaptchuk, a researcher at Harvard Medical School in Boston, Massachusetts, was showing the audience a cartoon in which a doctor hands over a prescription note. “I want you to take this placebo,” says the white-coated medic to her bemused patient. “If your condition doesn’t improve, I’ll give you a stronger one.” The chuckles were a response to the absurdity of openly treating a patient with fake pills. By definition, placebos have no active ingredient, so the idea that someone might benefit from knowingly taking one — let alone that different placebos could have different effects — seems nonsensical. But Kaptchuk invited his audience to take the scene seriously. Honest placebos can work, he insisted. And some placebos really are stronger than others. Kaptchuk’s trials are overturning many assumptions about the best way to care for patients, particularly those in pain. 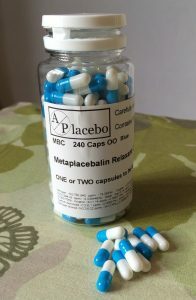 After four decades of probing the mechanisms of placebo responses, researchers are advancing the argument that inert pills are more than just negative controls in clinical trials: they can be a treatment in their own right.